Experience the best of many islands from a 45' catamaran based in Road Town, British Virgin Islands— the thrill of exploration, the elegance of yachting life, the serenity of open water, the radiance of the sun. The Lagoon 450 has become the benchmark to which other cruising catamarans are measured, and for good reason. VPLP architects, in partnership with Lagoon and the celebrated Nauta Design studio, have been brilliantly successful in the Lagoon 450. Cool Change is the "owners" version, rarely available in the charter industry. In the owners version, the starboard hull is exclusively the master suite, or captains suite for your bare-boaters. The suite includes a large private bathroom, significant closets and storage, desk, settee, and queen berth. The port hull offer two additional state rooms with private heads. These are also well appointed for your guest. Cool Change is also outfitted for convenience. She has upgraded engines for solid up wind motoring when necessary. An upgraded electrical inverter offers you the use of the usual home appliances such as hair dryers, microwaves, toasters and blenders. Engage the large generator and you can run them all at the same time, and have full interior air conditioning with separate thermostats for each state room and the salon. There should be no sacrifices on your vacation. Lastly, the captain will appreciate the ease of operation. Cool Change was fitted for single handing so her owner can sail unassisted with his family. You'll appreciate those conveniences that are omitted from other charters. There is a chart plotter at the helm and at the nav desk, which has great visibility. The windless has controls at both the bow and helm, so its possible to anchor unassisted. All sail lines are led to the cockpit for single handing sail trim. A custom hard top bimini provides sun and weather protection, with view ports for minding the sails. When you arrive at base you will receive a full chart briefing, tailor-made to your trip. We will talk you through all the ‘must-see sites’, things not to miss, obstacles to avoid and we will fill you in on all our personal favorites. We will give you a good idea of which route to take based on your group, the weather and any events taking place, whether you want to join in the action or stay away from the crowds. To begin, a copy of the highly acclaimed "Cruising Guide to the Virgin Islands" will be sent to you upon receipt of your deposit. 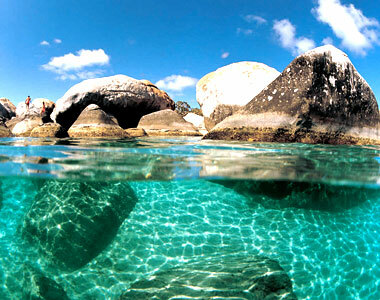 The Virgin Islands has some of the most beautiful beaches in the Caribbean, if not the world. Whether you want to top up your tan while reading that book you've been meaning to for months, take a romantic sunset stroll with your loved one or enjoy something a little more active such as snorkeling, scuba, surfing, or kite boarding. Cool Change is also licensed for fishing the BVI, No other charter management companies yet offers bareboats licensed for fishing.